Most small homebrew controller manufacturers use low cost sensors purchased from China. They can’t tell you how accurate or stable their sensors are because they don’t know. How do we know this? Because we also used to buy our PT-100 sensors from China! There is nothing wrong with buying from China as long as you understand what you are buying. The smart phone you are probably reading this on was likely made in China. We purchase our MyPIN controllers from China. But unlike MyPIN Controllers and smart phones, some products bought directly from China are a real crap-shoot. In early 2017 after taking a hard look at what we were buying and experimenting with several designs of our own we decided to start manufacturing our own sensors, and since then 100% of our sensors have been manufactured in-house. 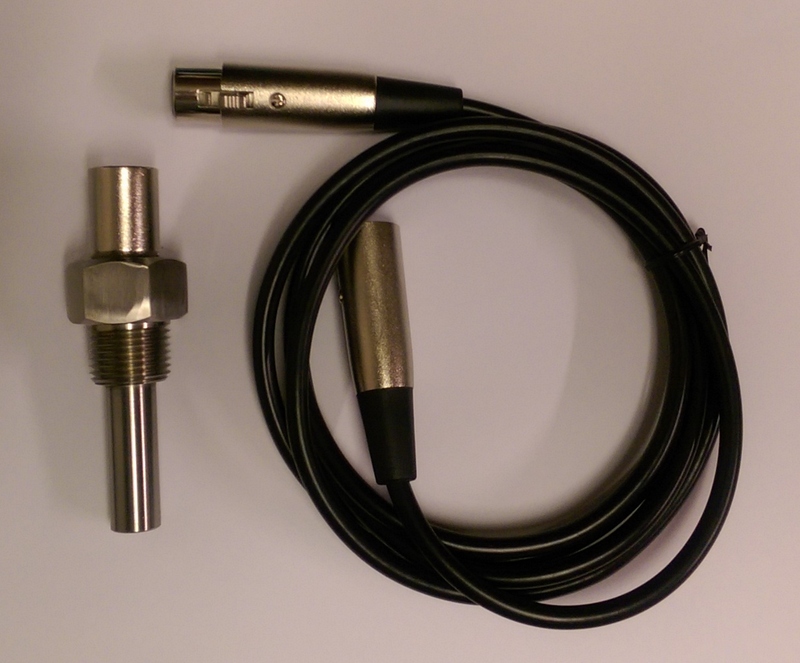 We start with a commercially manufactured RTD sensor (Part Number NB-PTCO-037) rated at 0.15% accuracy then we build up the electrical part of the sensor assembly and mount everything in a Stainless Steel 1/2″ MPT threaded thermowell with thermally conductive epoxy. The thermal epoxy completely fills the space between the sensor and thermowell, creating a thermal bond between the thermowell probe and the sensor. The thermal bond guarantees your sensor tracks with your mash temperature. All three wire RTD (PT-100) sensors have one wire connected to one end of the actual sensor element and two wires connected to the opposite end of the sensor element. Then your controller uses the two wire connection to average out any error your cable may be adding to your temperature measurement. Without this extra loop your sensor cable could easily add one degree F or more to your temperature reading. We make these connections as close to the sensor as possible, in the sensor head itself, while many others make these connections at the sensor end of the cable. Our 6 foot 3 wire sensor cables use 22 awg (Gauge) flexible copper wire encased in a tough, easy to clean, waterproof PVC jacket. Using 22 awg wire adds only 0.9 degree F to your temperature measurement, but this error is automatically subtracted out of your measurement with our three wire connection. Just going one size smaller – to 24 awg – would add 1.45 degree F to your temperature measurement. Also, because we make the critical sensor connections in the sensor head, all of our cables are extendable without impacting accuracy. Just daisy chain two together for a 12′ cable or three together for a 18′ cable. So, what does all of this mean to me? Our PT-100 sensors have an accuracy rating of 0.15%. As of this writing, we can-not find anyone else advertising their sensor accuracy! Our 6 foot 3 wire sensor cables are made with 22 awg (Gauge) flexible wire. Our sensor cables are covered in tough, easy to clean, water proof PVC. Our sensor cables can be daisy chained together for longer length. Our sensor cable can be unplugged from either end. Ships with every Temperature Controller we sell. Although commercially available PT-100 sensors are rated at a much higher temperature range of -200C to +850C, our PT-100 sensors are designed and manufactured for brewing beer and are only rated for typical temperatures experienced during mashing and boil.